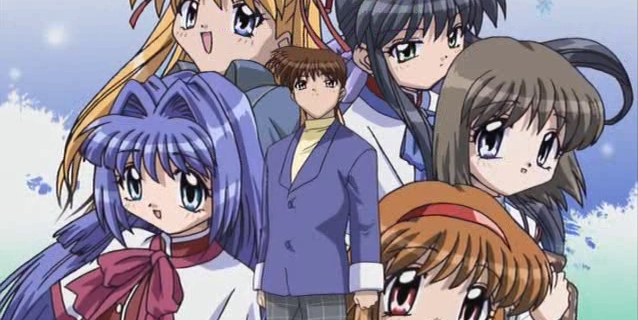 I previously reviewed the 2006 remake of Kanon, so I won’t repeat the plot. This is the “old” version, and despite only being a few years older the difference is quite visible. The animation, while perfectly good at the time and still acceptable in most quarters today, somehow looks flat next to the glorious eye-candy of the remake. The drawing style is slightly more extreme as well. More significantly, several of the choices it makes about how to tell the story don’t feel right. For example, the monsters that Mai fights look like nondescript blobs, while in the remake they were invisible. The moment when Makoto drops the cat feels like a fumbled accident, reminiscent of the comic blunders of 80s anime, while in the remake it was shown as a momentary loss of conviction, lending it much more character significance. And the point where he does actually decide upon one girl feels sudden and unexplained here. All through the series the pacing, scripting, acting and direction just aren’t what they could be. That said, the story and lovable characters are still here. And even the imperfections in this version don’t make it bad – merely not as great as it could have been. Hindsight is a wonderful thing if you can get it, and so is a huge budget. Kanon proved itself to be worthy of both.